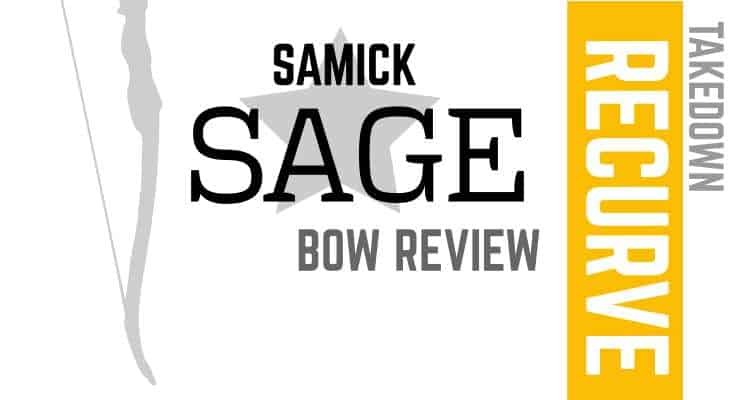 Overall the Samick Sage takedown recurve is an excellent bow, not just an excellent bow for the price, but an excellent bow by anybody’s standard. It will shoot as well as bows in higher price brackets. The Sage is something you may well be just as happy seeing mounted on your wall as well as shooting comfortably and accurately with. It’s a great recurve bow. Good for both hunting and recreational archers who target shoot. So, the Samick Sage, what’s the big deal? First the name… Samick is a Korean manufacturer. got it… Sage? I’m not sure exactly where that fits into archery. As I understand it, and according the Oxford English Dictionary, Sage is either a plant or a wise person and hmmmm…. I think something got lost in translation when they came up with the name. Review by 3D Archery, which includes un-boxing, setup and shooting a #45 (45 lbs draw weight) Sage. A combination of Maple and Dymondwood in the riser leads to a beautiful durable 2 tone semi-gloss finish on the riser. It has a comfy grip albeit without any thermal material or padding so you’re holding the wood. But wood doesn’t feel as cold as metal due to its lower thermal diffusivity so that isn’t going to be much of an issue. The riser for this bow also comes in both handed variations, just for clarity, normally the bow you draw the string with is the handedness of bow you’ll want, i.e. if you pull with your right hand you want a right handed bow.. This riser has a cut-past center shelf which allows for a lower angle between the string and the bow, i.e. the string can apply force directly in a straight line to the arrow without the arrow having to deviate to go around the riser, this gives a more efficient delivery of power than a bow with a cut to center and also helps make the bow easier to tune and more forgiving as far as arrow selection is concerned. The riser gives you the option of being able to shoot off the shelf or fitting a stick on or screw in arrow rest. Laminated hard maple surrounded with matte black fiberglass with reinforced phenolic plastic bow tips for durability when using upgraded bow strings. The limbs for the Samick are available in draw weights from 25lbs up to 60lbs and as they’re easy to change this makes it an ideal bow for the beginner who wants to start on a low draw weight and progress up the scale as they become more experienced. We’ve seen a few reports of quality issues such as incorrect limb alignment, ill fitting screws, limbs breaking etc and all we can say here is that occasionally as with any product there will be small number of defect units that making it out of the factory. So, as always I’d suggest you make sure to purchase from a large retailer with good customer service in case you need to return for a replacement. The standard limbs for this bow give it a 62” AMO length, but you can purchase the limbs from the Samick Journey to make it upto a 64” AMO as both bows use the exact same riser. An experienced archer may find this bow to be slightly heavier than more expensive alternatives, however for it’s class the weight and balance of the bow are fine, and the length of the bow compared to other recurves with 59”-61” length gives it an advantage when it comes to accuracy. Fitting the bow with an upgraded string will result in a faster shot that should improve your accuracy however this (amongst others) is an upgrade you don’t have to make, and as a beginner you’ll probably not even notice, I’d suggest you try it out of the box first.With a smooth and easy draw giving good power output the sound of the bow may be a little loud for some hunters but this can be easily remedied by adding string silencer. A traditional looking bow with a handsome quality wooden finish to the riser. In the box, unless you’ve ordered a special package you’ll normally only receive the limbs, the riser and string, this bow generally comes without any other accessories or a stringer. The limbs on this bow attach by sliding into a pocket and are secured with ergonomic finger tightener knobs which means you can assemble and disassemble it without any tools to hand and whilst it may take quite a few turns on the knobs to fully secure the limbs the process is relatively quick and easy but not as easy as snapping in an ILF limb for example. The Sage comes with pre-installed fitments for an arrow-rest, plunger, stabilizer, sight, quiver and you can even fit a bowfishing reel, but unless you purchase separately none of these are usually supplied in the package. Usually supplied with decent quality Dacron string that should last for many thousands of shots and is fine for the beginner. The string can be improved through upgrades as the limbs on the bow support better strings due to the protective coating on the ends. You may want to upgrade to a higher performance string to improve speed and shot accuracy once you become more experienced. Depending on where you order this from it may or may not come with a stringer tool, so be sure to check. If you don’t receive one, this isn’t a major issue as they’re available for no more than $10. The ‘Sage killer’ or ‘Sage v2’ is designed by the same people (but not sold by the same company) and it lives upto the name, it’s lighter, more polished and has slightly better build quality than the Sage. A good looking bow with a wide range of draw weights and also available in 62″ or 64″ AMO lengths, a very affordable price point and limbs that can be interchanged with those from the Samick . The only place where the Sage betters it is that you can’t assemble the Spyder or take it down without the supplied tool. Checkout our full review here. From the largest US archery manufacturer comes a great beginner bow available for juniors (PSE Jr Razorback) but only up-to 35 lbs draw for adults, that draw weight should be fine whilst you are learning, but if you want to go higher you’ll be stuck with the Razorback. Another downside to this bow (for some) may be the white limbs with the PSE logo making it look like a target shooters bow. More in our full review. The Jaguar has a metal riser with a thermal grip, the riser is made from aluminium and magnesium that makes this bow lighter than the Sage which is a plus point when you are starting out as your muscles will tire more quickly from a heavier bow. The issues with this one are firstly for lefties, you can only get it in the right hard version, the supplied arrow rest is a little on the flimsy side (although this can easily be replaced) and the assembly and disassembly requires locating bolts inside the riser with the screws which can be a little fiddly. In-depth on the Jaguar here. A decent quality traditional takedown barebow. The Courage comes in a range of draw weights, is light, nice to look at and is supplied with a 3 year limited manufacturer warranty and a furry ‘rug’ style stick on arrow rest. All the necessary fitment points for quiver/sight, stabilizer and arrow rest are pre-installed on the latest iteration of this bow. As a beginner though, you may want to look at something with a longer AMO length for an easier experience as this one only comes in at 60”. Our lowdown on the courage is here. Samick are a Korean company that originally made Pianos and back in 1975 started an archery bow manufacturing department, possibly due to some of the manufacturing skill crossover involved in the production of both pieces of kit. Samick Sports Co Ltd is how as an archer you’ll know them today as they are one of the leading distributors of archery equipment worldwide with over 50 countries on their client list and they make bows for all levels of archer.